I have a hard time leaving the thrift store without spotting at least one buried treasure. And while there is something to be said for clothing and housewares, I just love a good knick-knack! Animal figurines in particular. 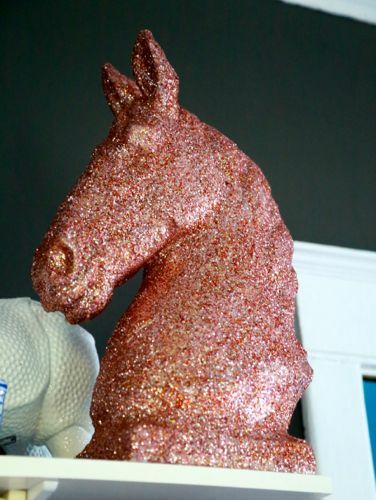 And because a little kitsch is never enough, I like to double down with a good coat of glitter. 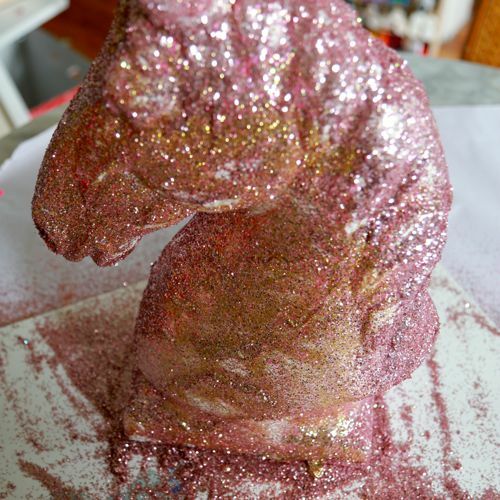 The great news is, if you follow the secret recipe, you can cover any surface in glitter and it will never shed. That's right folks: IT WILL NEVER SHED. Want to find out more? Let’s go! Use paint brush to apply a layer of glue all over the surface. 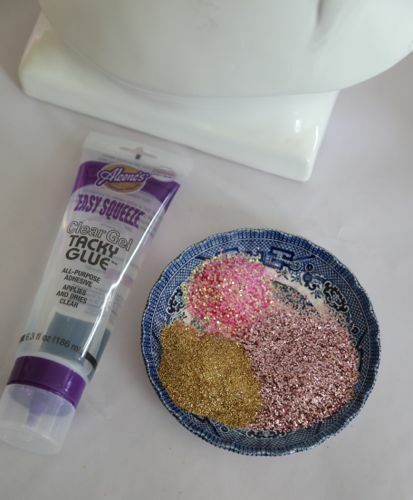 A thick glue like Easy Squeeze Tacky Glue will make this part much easier! 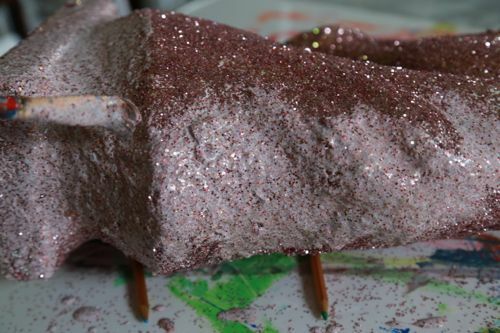 While the glue is still wet, toss liberally with glitter mixture. Allow to dry overnight. 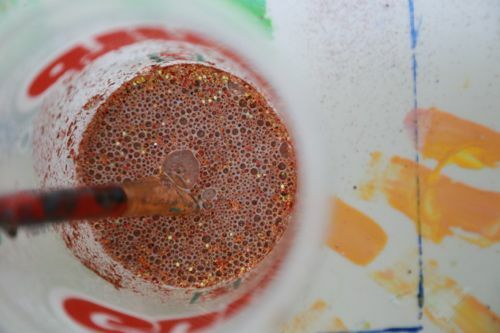 Secret solution:In a disposable cup, mix together equal parts glitter, glue, and water. 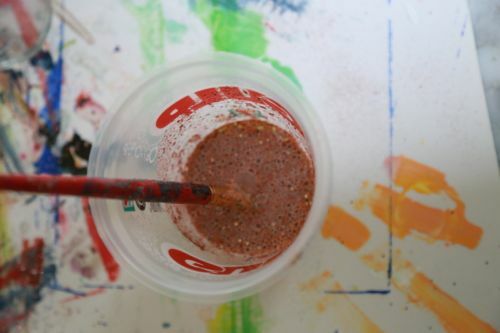 Blend thoroughly using your brush or a plastic fork. Look at it close up. Isn’t is beautiful!?!?! Apply the mixture all over the surface of the candle working from the top down. Expect a lot of dripping. You may want to turn it on its side and rest on a couple of pencils (see above) to access every angle. 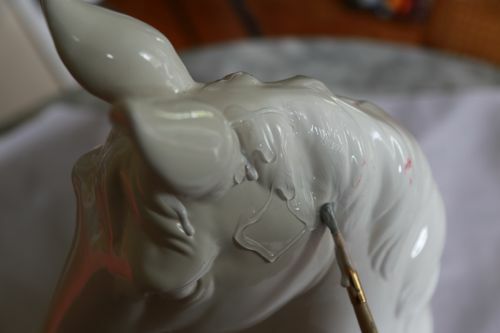 Allow to dry, then add a second coat if needed. TaDa! Double the sparkle and no shedding. 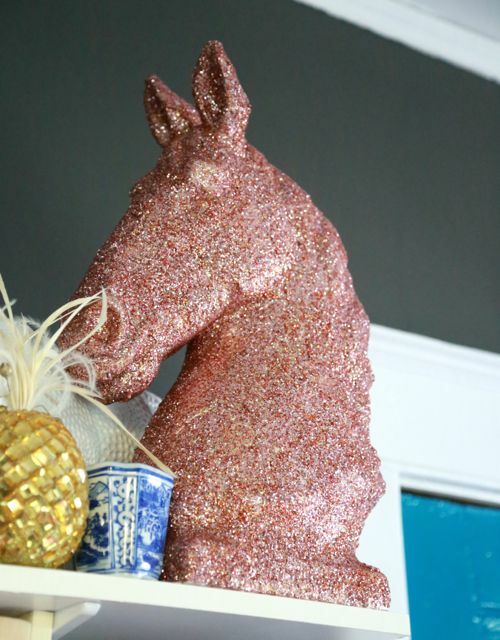 This is how you do glitter! You lost me on this one, Aunt Peaches. It just seems wrong. I for one love the idea and you did a wonderful job. 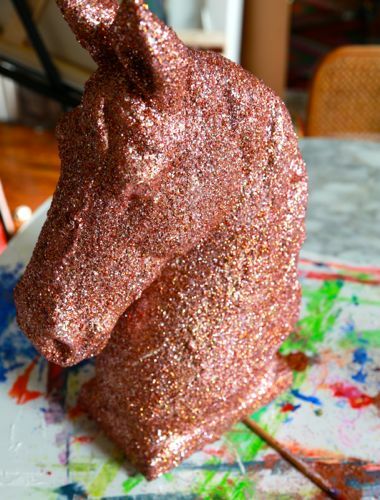 I agree, everything's better with glitter on it! Thank you for posting!